Thank You to all of you who sent me kind words and to those of you who have been praying for my friend Amanda. I am happy to say that is is progressing and we (me, Amanda, her family and friends) are expecting a full recovery. Amanda’s hope is in God and it is Him who is giving her the strength to fight this battle and believe that she will overcome this! She has progressed so much in a week. She is talking well, she has regained some feeling and use of her left side. She is still working at swallowing. I received a report earlier today that she was not in any pain, and I pray that has continued! She is also 14 weeks pregnant and the baby looks healthy and has a strong heart beat! I wanted to update all of you who have been so supportive this last week. I will try not to mention her here all the time so that I can respect their privacy but she definitely occupies my every thought. Last Sunday night was one of those moments when your whole world changes. I hope I never lose this perspective of how precious life is and how quickly it can change. Last week we ate out a few too many times although we are healthy options. Between Chipotle, Subway, Pita Jungle, and drive thru bean burrttios we were pretty well fed. Meals at home were rounded out by bowls of cereal, lots of fruit, Breakfast Stir Fry, oatmeal, quinoa, and baked potatoes. It wasn’t the healthiest week in our household but it wasn’t too bad either. Breakfast this week will be oatmeal, Breakfast Quinoa, Cereal, and maybe a Breakfast Stir Fry. Lunch will be leftovers, pancakes, Baked Potatoes, and veggie wraps. 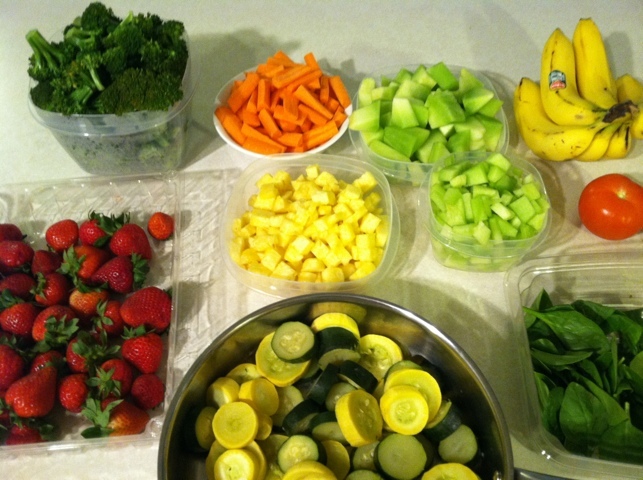 Snacks will be smoothies, toast with almond butter and apple slices, fruit, and hummus with fresh veggies. Monday: This is Memorial day in the U.S. and also our anniversary so we are going to try a new vegan restaurant. Tuesday: Grilled Portobello Burgers, Potato Salad, and more veggies. Wednesday: Quinoa Tacos, with Unfried Black Beans, Fresh salsa and fruit salad. (If there is leftover quinoa and beans I may mix them together to make burgers). Thursday: Not So Tuna Salad, spinach salad, and fresh fruit. Friday: Date Night so I usually make something easy for the boys like baked sweet potatoes and fruit while my husband and I have something else. I know I’m getting off pretty easy in the cooking department this week. Hey, you gotta take it when you can get it right! What about you? Do you have your Plant-Based Meal Plan ready for the week? I’d love to see it! It sounds like wonderful progress for your friend. I’m so glad to hear it, Holly! I hope for continued speedy and full recovery. Thank goodness her baby is okay!